Scattered throughout the various collections are letters written on stationery supplied by the YMCA, the Knights of Columbus, and the Salvation Army. 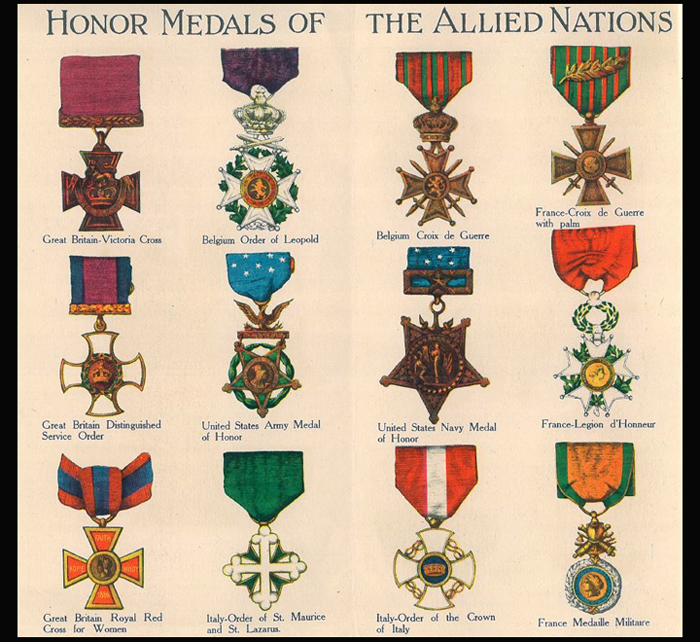 This collection consists chiefly of letters written by soldiers who served in the United States armed forces during World War I. Other than the fact these soldiers and their families were residents of New York State at the time, there is almost no evidence indicating any person was related to any other person. The collection also includes a scrapbook, photographs, picture postcards, and miscellaneous printed items. "Dearest Lill: … We've all filed a postal card to our relatives announcing our safe arrival across seas. When our ship gets to Europe safely, the cards which are held here are posted by the authorities and in that manner our people are quickly assured of our safety … I wish that if you ever definitely learn that I am no longer a member of this ball of mud, you'd open the expressed box and send all papers in it to Sabyna along with the tin box and the package attached to it. That sounds like a peculiar request to make. Some day I'll explain it but now I want to be sure that it is done." "… We are all well but miss you so much. Tom said he wanted to go meet Daddy and bring him home … Tom loves to play out doors and does all day long. Tells everybody his name and says his Daddy gone on big boat. Every day he says God bless Daddy. … It's two weeks to-day since you sailed it seems much longer …"
Papers documenting that Frank Charles O'Reilly of New York City attempted to enlist, but was rejected by medical examination and then rejected by Local Board #164. He then enlisted in the Canadian Army at Toronto on November 16, 1917. While he was in the Canadian Army, he was drafted into the U.S. Army. Included is a letter, dated November 24, 1917, to the Local Board asking, "Kindly make note of same so that he will not be recorded a slacker." These letters, addressed to Thelma L. Bishop of Elmira, New York, are from two American soldiers: Corporal Garwood E. Dains (Co. G, 102nd U.S. Infantry, 26th Division) and Sergeant Henry J. Dube (HQ Co., 102nd U.S. Infantry, 26th Division). Their letters are generally friendly and personal with some discussion of military life, mentioning the squalid conditions of the trenches along the western front in France, a gas attack that afflicted Sgt. Dube, and the fate of Thelma's brother who was taken prisoner by the Germans. Their low opinion of German people expressed in the letters reflects the anti-German propaganda expressed by the U.S. government and other sources during the war. "I am lucky to say that I have been in the trenches twice or in other words have done two hitches in Hell as we call it and sometimes we think seriously and wonder if the latter place is any worse than some of the days we have spent." "… One must see these trenches to realize what they are like. In our sector the mud and water was up to our knees & if you raised your head over the top a Boche sniper would take a shot at it …"
"… there are nights in the trenches when there is no noise but the squealing of rats, some of them as large as cats …"
Alton Clark's letters, mainly to his sister, Edna, in Moravia (Cayuga County), New York, comment on training at Camp Dix, New Jersey, and on life in the field in France. "… I was drafted last Sept. … I do not regret it as we have got to fight to protect our country and I know that you would not want a slacker. I hope some day that I will have a farm for I love the green grass and trees and animals …"
"… There were 22 of us passed the gas inspection out of 27. I have been in the gas house twice. The first time it was what they call tear gas, and it's named right. We had to take our masks off before we came out and I nearly drownded [sic] from tears. The second was what they call chloride gas, believe me we didn't take our masks off in that. If you get a couple of breaths of that it's Good By John. Some of the boys left their rings on and it turned them just as black as a stone …"
A diary kept by William Matthew Degenhart of Lackawanna (Erie County), New York. details his experiences from his arrival at Camp Devens (Ayer, Mass.) to the battle field in France and later guarding prisoners of war during the post-war occupation of Germany. Included are copies of general orders, war poetry, and a record of letters he received and answered. His handwriting is exceptionally easy to read. The entry for September 27-29, 1918, begins: "Roaming all about woods looking for our lines. We had completely lost our bearings …"
The entry for October 2-16, 1918, begins: "Kept on advancing through heavy brush and across valleys through mud, m.g. [machine gun] and artillery fire. …." Last stanza of "The Soldier," attributed to Edward Mettler of Company C, 165th Infantry in the November 1918 issue of Desmos, the quarterly of Delta Sigma Delta. [Words in brackets are the words and punctuation that appeared in Desmos.] Degenhart dates the poem: Le Bouret – France, March 24, 1919. Or [And] she never killed a Hun. The letters, written by Roy W. Edgett, were sent to his sister, Frances, in Pulaski (Oswego County) and Syracuse (Onondaga County), New York, and concern his activities and experiences at various stateside military posts, including Fort Slocum; Chicamauga [National Military] Park, Georgia; Waco, Texas; and Camp Dix, New Jersey. "So far there are four of our men who have died from the flu and there are still some of our men in the hospital and they are pretty darn sick, two of them have got the pneumonia and bad cases at that so I guess that they're [their] chances very slim of pulling through." This collection consists of approximately 170 letters written by Basil Beebe Elmer of Ithaca (Tompkins County), New York, to his parents, Herbert and Bertha. Selected letters have been transcribed and digitized. Basil, who was born May 29, 1892, graduated from Cornell and became a banker in New York City after the war. He and his wife, Alice, had two children: Alice and Basil, Jr. He died February 23, 1962, in Bronxville (Westchester County), New York. "My dear Parents: "… The men too are in good shape. I just went through their cars. They were singing and laughing and with no complaints whatsoever …Please be glad and happy for me in this great adventure. The whole thing is so teeming with excitement and interest and romance that I occasionally thrill at the thought of it and long to get at it. It is a wonderful game. …"
"… We are living in dug-outs … We are some forty odd feet under ground. … it is dark, night and day, but we have plenty of oil lamps. The dugout is a spacious affair with some twenty odd large rooms. They are well ventilated. Each room has a stove, desks, bed, chairs, floors, ceilings, shelves, wash stands, hooks for clothes, etc. Each room opens on a main hall. We are not crowded in anyway. Our meals are excellent. At table is the colonel, a major, Father Duffy, the chaplain, and four lieutenants. Our dinners always have soup, salad, meat course, wine and dessert and coffee & of course bread & butter … I still ride up to the line on horseback each day. I am enjoying my daily rides more than I can tell …"
"… Olie [Ollie] Ames received a cablegram last night telling him that he had a fine daughter, born July 3. Now, naturally, he is worrying. He came up to see me and I told him that by this time his wife was all well again and made him feel better, I think. He is a fine boy and I think a lot of him …"
"… We were now near the front line … We entered the line and drove, drove, drove. I can never describe it. It doesn't seem real. It is all a dream – a nightmare. Day after day, night after night, unceasingly. … Ollie Ames and Joyce Kilmer are buried side by side at the edge of the wood … I sat there yesterday, thinking. "Ollie, Ollie!" I thought of his wife and his mother. And I thought of you. How dear you two are to me! Nothing else matters to me – only you. … what a wonderful thing [Ollie] has to pass on to his wife and daughter! I find myself thinking of Ollie constantly. I know I must stop, but he was my best friend and he died so bravely that I cannot forget." These papers are comprised chiefly of letters Roy Elston sent to his family in Unionville (Orange County), New York. Included is a typescript history of the 303rd Ammunition Train. "Dear Mother, We are bidding farewell to Camp Dix and you all tonight. Don't know where we are going but we're on our way. Know the point of embarkation but not sure at what foreign port we'll land … With love to you all and Good Bye, Roy"
"This is a fine Sunday morning and makes me feel like taking an auto ride through the country … We are certainly getting dandy meals here …"
"… so I'll … relate some of our past and present experiences which is something we have not been able to do previous to this … on Sept. 12th we moved to Limey where the big St. Mihiel drive started and in which we took our part. For a few days we lived there in an old church which had been pretty well destroyed by shell fire … After several weeks there we … gradually worked our way up to the Argonne Forest about which you have read much in the papers. Here we took part in the final drive of the American Army … We have slept in barns, old dwellings, churches, out in the open, barracks and pup tents. All through we have always been well supplied with food and it is remarkable the way in which they have been able to always have supplies on hand under all conditions …"
"My dear Mother and all, … I expected to sail sometime this month … I will sail just as soon as my turn comes. We go in turn according to numbers. They are up to 720 now and my number is 796. They think that I will be able to get off by the last of this week or most surely by the first of next …"
Lamonte Evans was born and raised in Newport (Herkimer County), New York; he married Emma Carter of Utica (Oneida County), New York, and lived there in the home of her brother. The diary recounts his experiences while being posted in the Canal Zone of Panama; he frequently comments on the tranquility of Canal Zone in contrast to the battlefield in Europe. Also, he often reminiscences about his family and life back home. The diary contains snapshots of the Panama Canal zone, his fellow servicemen, his home and family in Utica and Newport. The inside of the back cover contains a pencil sketch of Havana Harbor. The letters were sent to Harold B. Hill's family and friends in Goshen (Orange County), New York, from Kelly Field, Texas, and from France. 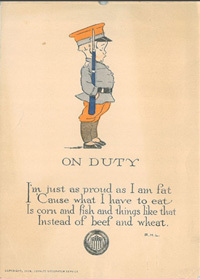 Collection includes a booklet of photoprints, entitled "Army Life," which is a graphic summary of life in the army of the early-twentieth century. "Friend Hazel: … You better take care of yourself so you don't get the Spanish influenza as it is a very bad disease." Collection of service information of about 40 New Yorkers mainly from Oneonta, Syracuse, Buffalo, and Ithaca. The papers include letters James William Husted, Jr., sent to his father while serving in the army during World War I and a scrapbook containing maps and other documents related his service. Husted's father, James William Husted, served in the U.S. House of Representatives from the Peekskill (Westchester County), New York, area from 1913 to 1923. A desire on the part of James, Jr., who at the time was in New Haven, Connecticut, to be accepted at the "Plattsburg training camp" in northern New York State, sparked a series of telegrams between him and his father, who offered to do what he could to facilitate his acceptance. His "Officer's Record Book" indicates he eventually received training at Madison Barracks at Sackets Harbor, New York, and that his service in the 15th Field Artillery began August 29, 1917. First Lieutenant James W. Husted, Jr. served as II Corps liaison with artillery from July through October 1918, and was "honorably discharged from the service of the United States for the convenience of the Government" February 25, 1919.
the "Schedule of Instruction, Reserve Officers' Training Camp, Madison Barracks, N.Y., May 15th to June 15th, 1917." These 39 letters, addressed to Harry L. Kline's mother, Clara R. (Mrs. Leonard R.) Kline of Newburgh (Orange County), New York, concern his military experiences. Included is a page cut from a magazine with four line drawings showing how a father, a mother, a small brother and a fiancé imagine "Their Boy in France." The page has a number of pin pricks in the top two corners, indicating that it was moved a few times before it was carefully saved with the letters. "We started for France at 2:30 pm the same day [July 26, 1918], swinging slowly past the Statue of Liberty. I cannot explain to you my feelings as that old statue finally faded out of sight." Charles Edward Lydecker was born in New York City on May 26, 1851. He was admitted to the bar in 1873. … Besides his law practice, he devoted much time to service as an officer of Company H, Seventh Regiment of the New York State National Guard. He enlisted in 1874, beginning as a private, then gradually moving up the ranks: corporal (1881); sergeant (1882); lieutenant (1884); captain (1888), and major (1901). He was honorably discharged from duty in 1909. Thereafter, he was active in the 7th Regiment veterans organization. Lydecker also served as president of the National Guard Association (1906) and of the National Security League (1916). Both organizations advocated a strong national militia and defense policy for the United States, which was the subject of periodicals, articles and pamphlets authored by Lydecker. Leigh Kent Lydecker, Charles's son, was born October 31, 1882, in Greenwich, Connecticut. He was admitted to the bar of New York in 1904. Like his father, Leigh Lydecker served in Company H of the Seventh Regiment if the New York State National Guard, attaining the rank or corporal while on active duty from 1904 to 1908. He returned to active duty in 1916, serving in the Depot Battalion until he was transferred to the officers' training camp at Fort Monroe, Virginia. There, he was commissioned First Lieutenant, Field Artillery Officers Reserve Corps, in August 1917, and assigned to the 149th Field Artillery, 42nd Rainbow Division. In July 1918 he was promoted to the rank of captain and assigned to the Field Artillery Brigade Filing Center in Anniston, Alabama, where he was in charge of training and instruction. In November he was transferred to Fayetteville, North Carolina, where he assisted in the layout and design of Fort Bragg. He was honorably discharged from full-time active duty on December 23, 1918, but promoted to major on February 19, 1919, and assigned to the 153rd Field Artillery Brigade. In 1928, he was commissioned lieutenant colonel and assigned to the 307th Regiment Field Artillery which drilled many summers as Pine Camp, New York. detailed descriptions of artillery/infantry coordination in attacks. Harold W. Mitchell, of Canisteo (Steuben County), New York, graduated from Syracuse University in 1914 and Harvard University School of Public Health in 1915. He worked for the American Red Cross and Indiana State Board of Health before enlisting in the United States Army in 1917. After basic training at Camp Mills, Long Island, he served with Sanitary Squad No. 1 as chief health officer and sanitary inspector. The war-year letters in the collection, written to his parents, describe his training at Camp Mills and his duties as a sanitary officer in France. He dwells on matters of sanitation, especially regarding food and water supplies as well as administrative problems and life with the sanitary squad. "I never was more proud in my life and yet I realize humbly that it is nothing of my own doing … I am very happy that I will be able to 'do my bit' …"
"Fighting for democracy is a pretty abstract cause when you get lonesome or homesick but a tangible proof of the backing and sacrifice of the people back home can be appreciated by every soldier whether he appreciates the grandeur of the cause or not." Howard Moore, a farmer and telephone company executive who lived in Cherry Valley, New York, for most of his life, is best known for his life-long crusade as an absolutist conscientious objector to all war. He was imprisoned for noncompliance with orders to report for military duty when conscripted during the World War I. During World War II he was detained briefly for his failure to comply with selective service registration laws. During the Vietnam war he aided draft resisters. correspondence with family, fellow COs, and government officials. The remaining portion of papers concern his opposition to military conscription mandates of the United States government during World War II and Vietnam as well as peacetime drafts. These 44 letters were sent by Lawrence M. Salleck to his parents in Buffalo (Erie County), New York. They cover his service from the summer and fall of 1916 when he was stationed near the United States-Mexican border to his tours of duty at the reserve officers training camp at Madison Barracks at Sackets Harbor, New York (spring 1917); Camp Dix, New Jersey (August 1917); Augusta, Georgia (September 1917 to about February 1918); camps in Oklahoma and Texas; Selfridge Field, the base for the Army Aviation Corps, near Mount Clemens, Michigan (June 1918); and, finally France (June 1919). "… The class of men is remarkable. Many from Cornell, the Yale batteries & from many other colleges … We are studying down here all of the time. It's just as much a college as was Cornell. The instructors are just as capable … But the thought hit me all of a sudden one day – what are we studying? And the only answer I could find was – the most scientific method of killing our fellow human beings …"
"… but yesterday another plane fell but no one was hurt … For a while we were pretty scared but right in the middle of it all a regular army inspector came around and ordered that no more of the old ships should leave the ground. Gee but we were all thankful. They were about a thousand years old & every time you went up you were scared a wing would drop off or the motor would drop out of the plane. The new ones however are little beauties …"
"Dearest Folks, … thank you both for the delicious box of cake & chocolates … You can't imagine how very much we do enjoy those things … We took down a Lewis machine gun last week & learned the name of each part of it. It sure is a wonderful weapon & very simple considering what it does …"
Guy Joseph and Elbert Seigfred were the sons of Joseph and Alice Seigfred of Seneca Falls (Seneca County), New York. Guy's letters comment on training at Fort Dix, New Jersey, social life and customs in France, and military action on the western front. Elbert wrote about naval duty primarily off the coast of Alaska. "… Company F members are not allowed to communicate with anyone except those in their own company. However, none of them are sick. In fact, just as I am writing, the entire company is out in front playing basketball and other games for exercise … He is permitted to receive mail but is not permitted to write just now." Discussing a burial detail, Guy wrote: "… I'll say I was glad in a way to see that the Bosh [i.e., Boche] dead outnumbered the Yanks"
Carleton Simon, Jr. (Carlo), son of Dr. Carleton Simon, Sr., and Monetta Simon, entered World War I as a private but was eventually promoted to corporal. The early letters were written from New Haven, Connecticut, where he received training while being quartered at the national guard armory. "Dearest Mother: … I have been picturing your mental condition ever since you heard the news. Now, Mother, listen. I tried to wire you as soon as I could … It's true I have been wounded, but as usual I had my fingers crossed and so came out pretty lucky. All in all I was hit in eleven places but every one proved to be nothing but a scratch and they have all healed except one on the back of each hand …"
"Dear Carlo: When you write to A.A. Housman or anyone else, cut out signing "Carl" which is not your name but is German. Sign Carlos which is O.K. or Carleton, Jr., which is also O.K. You understand." "Dear Sir: … I was wounded at the same time as your son, Lieutenant Clifford Henry. He was in command of one of the platoons of my company … last evening he passed quietly away. Although Lieutenant Henry was a new officer to us boys and we did not have him with us very long, his memory shall always be sacred to us. I never remember meeting an officer whom I took such a liking to right from the very first. … Your son, Sir, was a soldier. He has given his life so that others may live …"
"Dearest Mother: This war is a grim, stupendous, hard-headed, hard-hearted battle to win … The cardinal conditions of success in this war are unflagging determination, almost superhuman patience and a courage born of right. This war is a dirty gray, a dingy-drab, cold and cruel fight to the finish … Soon the silent American women will be in the thick of this war, and then we will have brought our great force, if not the greatest. …"
Warren Spicer was the son of Frank E. and Nellie L. (More) Spicer, members of a central New York farm family who resided principally in West Amboy (Oswego County), New York. "Dear Mother: … I got my final pay and my discharge yesterday … and if you had seen me beating it toward NY State – why I went so fast my shadow was ½ mile behind me, 'cussing and falling down' because it could not keep up with me." The letters, addressed to Maynard C. Teall's mother, Seely B. Teall, in Sodus (Wayne County), New York, describe his military experiences in France. "And how much I admire the bravery and self-sacrifice that you – and many other American mothers, too – has so unceasingly displayed!" "… it is Mother's Day. I suppose that everybody loves his mother … But I feel that nobody has quite so many or quite so good reasons as I have. Lots of things have happened to me since I put my trunk in the wagon and started the horses toward Wallington en route to Dartmouth, but I can truthfully say that all my experiences, all the new meetings and friendships, all the increased understanding that comes with maturity have united to make me respect, admire, and love you more. …"
send the email at least two days before you plan to come to the library. NOTE: Photo ID, preferably a driver's license, is necessary to register for admission to the reading room on the 11th floor of the Cultural Education Center. This bibliography was created with the help of Aaron Noble, Senior Historian, New York State Museum.